Now for another part in this semi-irregular series documenting the way The Simpsons has shrunken and devalued its world by casting off characters and plotlines. 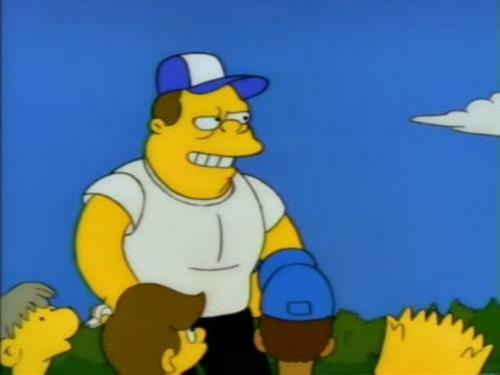 We met Nelson's dad way back in season 4's 'Brother from the Same Planet'. There he was the soccer coach who showed favoritism to his unpleasant son. You may also remember him from Season 6's 'Bart's Girlfriend', in which he reined Nelson in with a leash. So, what happened to Nelson's dad? He disappeared. In later seasons Nelson would be assigned a generic 'neglected child' background, in which his father abandoned him years earlier, offering him an excuse for his behavior, as well as a reason to feel sorry for him. 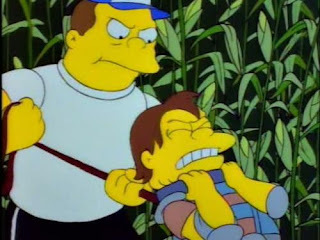 The show would then take it a step further, bringing Nelson's father back, explaining that he hadn't actually run off, but rather been kidnapped by a circus. Happy endings all around! What was lost with the exclusion of Nelson's original father? Accuracy! I don't know how many people reading this have actually met a bully's parents, but Nelson's father being a smug jock who encourages his son's bullying is incredibly well-observed. Nelson's father may be one of the most true-to-life things the show ever offered, and he was removed so that the show could be more generic and cliched.